The Election Commission has set up a committee [ pdf ] to probe in the leak of dates of Karnataka assembly elections prior to the CEC’s announcement. Times Now had flashed the election date as May 12 and counting date and May 18. This was partially correct information as the counting date was May 15. Times Now had got the date of election accurately. The news was Tweeted by media cell members of both BJP and Congress though, BJP’s Amit Malviya was singled out for most of the criticism. Amidst the ruckus created in political circles over leak of Karnataka assembly election dates, the channel which beamed the dates on its screens has escaped serious scrutiny. In a short reply [ pdf ] to the Election commission, the channel has said that the information beamed by it was not a leak as it was not accurate. Apropos letter ref no 193/6/2/2018. 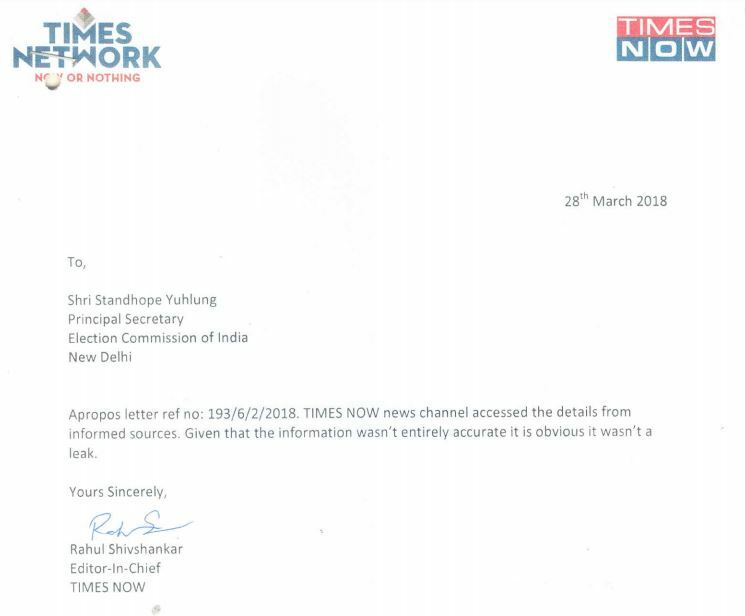 TIMES NOW news channel accessed the details from informed sources. Given that the information wasn’t entirely accurate it is obvious it wasn’t a leak. Meanwhile, the Congress spokesperson has continued to malign the activities of the Election Commission by questioning the credibility of the commission for allegedly explaining BJP’s version. Intriguing events on “Date Leak” & BJP’s role appear on @ECI_India website. 1st EC gives a clean chit to BJP National IT head by keeping him out of purview of enquiry, yet uploads another ‘Press Note’ explaining BJP’s version! It remains to be seen as to what findings will emerge from the election commissions committee and how political parties will respond to the outcome of the investigation.